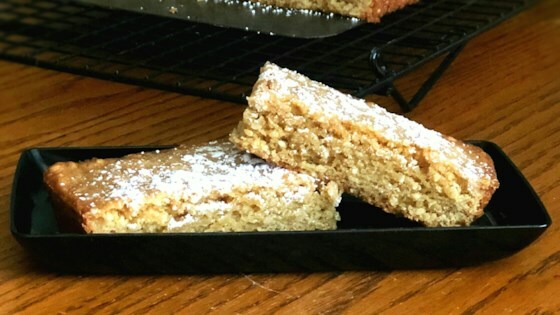 "Delicious bars to serve with tea or as a light dessert!" Preheat oven to 375 degrees F (190 degrees C). Lightly grease a 9x9 inch square pan. Stir sesame seeds into melted butter, and set aside to cool. Sift together the flour, baking powder, and salt. In a medium bowl, mix the eggs, sugar and vanilla into the butter mixture. Add dry ingredients and stir until well blended. Pour batter into the prepared pan, spread evenly. Bake for 20 to 25 minutes in the preheated oven. Cool and cut into squares. nice texture! I really enjoyed this recipe. It wasn't what I was expecting, but it still tasted good. The only thing I changed/added was cashew nuts. Since the cashew nuts were salted I omitted the salt from the recipe. Not too bad but not what I expected. I think I would have like the cookies rolled in the toasted sesame seeds as opposed to the seeds being IN the cookie. Excellent bars! Very easy and quick to make. I followed the recipe adding a sprinkle of powdered sugar to the finished product. They are very reminiscent of a peanut butter bar. Enjoyed by all.